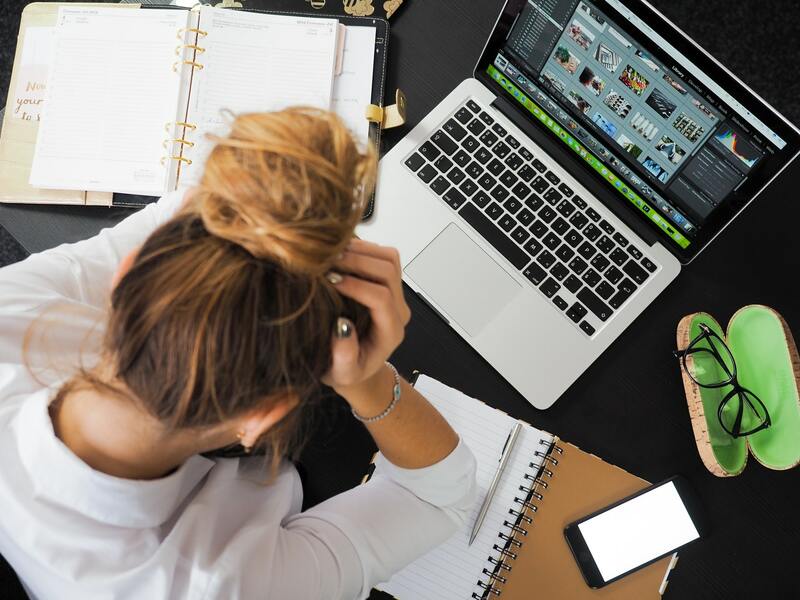 If you’re similar to millions of others in the workforce who have a typical 9-5 desk job, you may have discovered that the type of work environment you’re in isn’t overly conducive to your health. Sitting for extended periods of time does not tend to do the body any favors. My goal in this article is to inform upon the issues that a sedentary lifestyle cause, discuss the solutions that are out there to combat these issues, and make sure that we all know that we have a choice to battle sedentary issues and stay healthy regardless. The most obvious negative effect that sitting has on the body pertains to the back, neck and shoulders. The common position when sitting places your neck and head forward while sitting at a desk, which puts a strain on your cervical vertebrae. As far as immediate discomfort, this leads to sore shoulders and neck. For long term, it can permanently alter your posture in a negative way. Additionally, sitting puts significantly more pressure on your back than standing. Sitting in front of a computer at your desk compresses the disks in your vertebrae, which are meant to expand and contract as the body naturally moves. Once again, the more immediate issue is discomfort and soreness. Long term issues are recurring back problems, loss of flexibility, and other chronic back pain. Sitting for the majority of the day also leads to general weakness of the muscles and bones. The body is designed for walking, running, and other movements, and the muscles and bones used in these activities go idle as you sit, leading to weakness. Specifically, this can lead to hip problems and osteoporosis. Apart from muscular and bone issues, sitting has a negative impact on our organs. Blood flow slows when we sit and muscles burn less fat, leading to heart issues. The pancreas produces increased amounts of insulin, which can lead to diabetes. There are still more issues that we may not think about as much as we spend our day working on projects and assignments that confine us to our desks. Our eyes are subject to staring at screens for hours on end. Our wrists and hands are in uncomfortable positions for extended periods of time. The first step to preventing all of the issues that a desk job can cause is knowing the potential problems you face, and working towards a solution. Now that we’re aware of these issues, we can discuss what we can do to move towards a healthier day at work. One of the best ways to combat the health risks of long hours sitting at a desk is to get a standing desk. 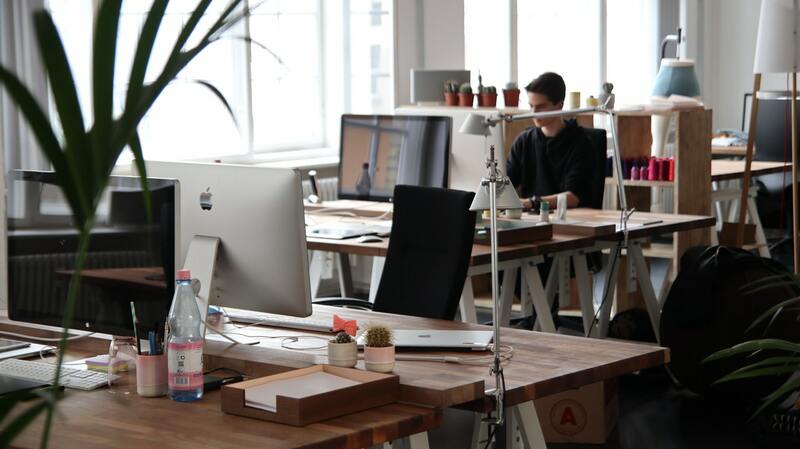 Standing desks are pretty self-explanatory, as they are desks specifically designed to position themselves higher up so that the user can stand while he or she works. All of the problems caused by sitting are listed above, and a standing desk takes care of all of that in one fell swoop. Now, a standing desk may not be a perfect solution for everyone. Some workers already have knee or back issues that standing all day might bring about pain just as much as sitting all day. Don’t worry, there are more solutions to discuss. Once more, if you can physically stand for the majority of the day, a standing desk is the number one piece of equipment you can get. That being said, they also make desk extensions that can go from sitting to standing, so you can divide your day doing both, effectively cutting down sitting time by whatever is tolerable. The next important solution is to get a good chair. Before I got a great chair I would say to myself, “How can I justify buying a 200 or 300 dollar chair? It’s just a chair.” That mentality seems crazy to me now. If i spend 8 hours a day sitting in a chair, why would I not have the best chair around? If I use it for 5 years, a 200 dollar chair costs 11 cents per day. Just over a dime a day to significantly improve my body’s daily comfort is a no-brainer. Now what are we looking for in a great chair? Padding, neck and lumbar support, adjustable features? All of the above, and there are tons of options out there. Head to an office store, furniture store, or department store with those types of sections. I promise there will be plenty of options that you can sit in and immediately feel the difference. Now once you’ve put that piece in play, think about ergonomics. Ergonomics refers to efficiency in the working environment. As far as equipment, it refers to putting yourself in positions that reduce stress to the body. Grab an ergonomic keyboard and mouse that put your hands in more natural positions. It may sound like a gimmick, but I’ve owned both and they do wonders. You’ll probably get a lot of looks from coworkers if you start busting out sets of squats or pushups throughout your day. But there are plenty of other healthy cheats you can do. Walk: Taking short walks throughout the day is a great way to counteract the sedentary nature of an office job. At the turn of every hour, take a quick 2-5 minute walk down the halls and around the office. Also, use some of your lunch break to take an extended walk. At a company near my home I often see everyone walking around the building once or twice or down the street and back. It is mostly during lunchtime. It’s a great way to work off the food as well as the long hours of sitting. Finally, getting away from your screen gives your eyes a break from staring too long at the monitor, which can lead to decreases in eyesight over time. And if you’re like me and typing thousands of words per day and clicking your mouse constantly, it helps give your fingers, hands and wrists a break too. Carpal tunnel is a real issue for desk jockeys, so any relief goes a long way. Stretch: Remember, muscles are under strain when sitting for long periods of time. Try stretching once during the morning and once during the afternoon to keep the muscles loose. I like to stretch during my walks around the office. I’ll stop every so often in an empty area and stretch for a bit. I’ve been caught a few times stretching by coworkers, but my health benefits outweigh the occasionally odd look or quick joke. Hydrate: Our body is primarily water, so staying hydrated is incredibly important. It helps the efficiency of our internal systems, organs, and muscles. It also gives us an excuse to get up and walk away from our desk. Drinking the recommended 8 or so glasses a day means 8 times we get up from our desk to get water, and probably a few more for strategic bathroom breaks as well. We only get one body, and it’s important that we take care of it the best we can. 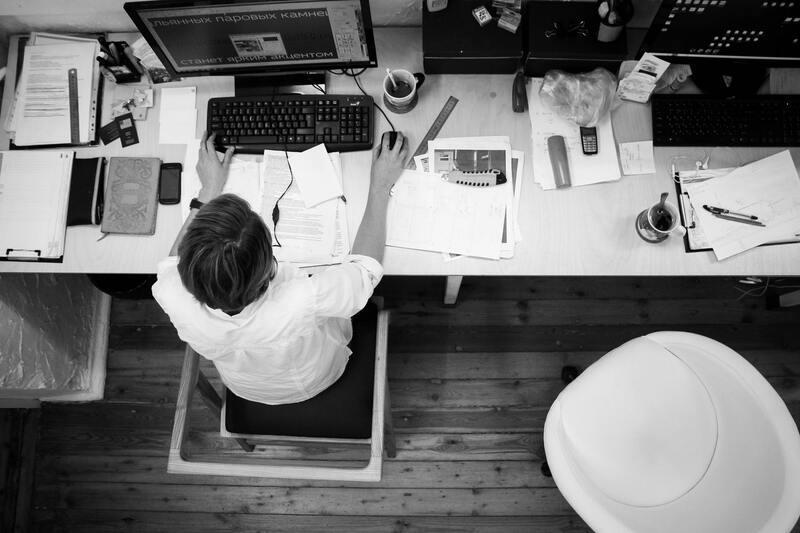 If your job involves sitting for 8 hours a day, that’s simply a disadvantage that can be overcome through a choice to do what we can to stay healthy and counter the negative sedentary effects with positive, healthy activity. Stand and move as much as you can, stretch, stay hydrated, and give your eyes a break. Makes sure you have the right equipment so that when you have to sit for long stretches of time, you’re at least doing so in the most comfortable way possible, minimizing stress to your body. We know the issues, we know the effects the issues have on our bodies, but we also know there are plenty of actions and choices we can do and make to stay ahead of the game. Good luck!